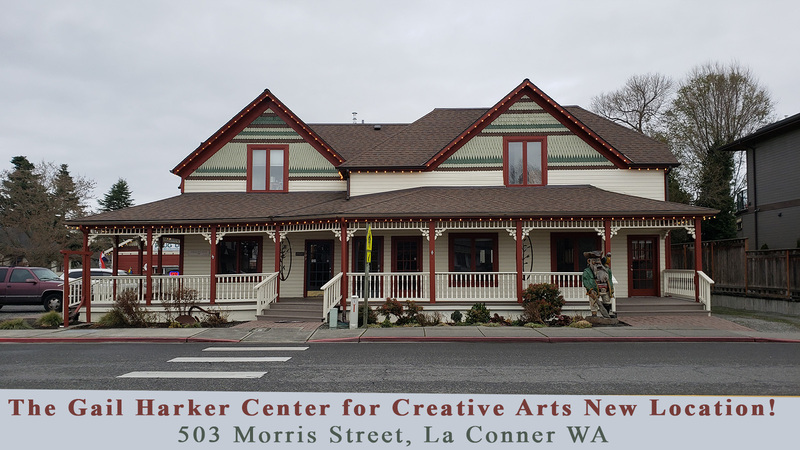 The Gail Harker Center for Creative Arts offers a comprehensive course schedule for artists of every level. 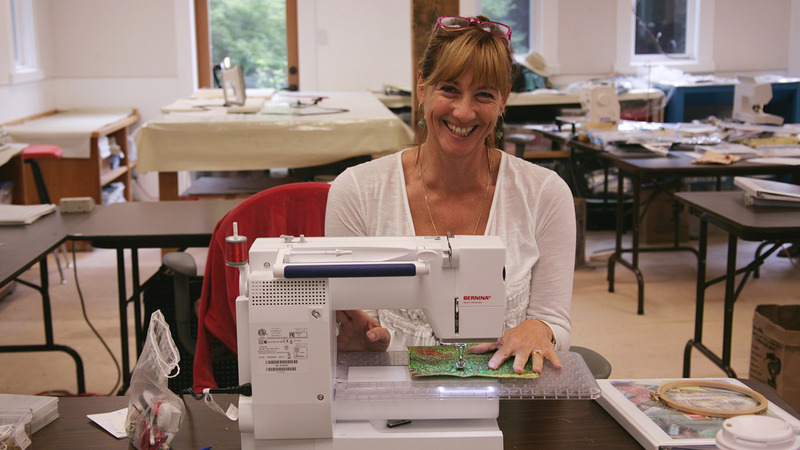 Our internationally acclaimed faculty conducts certificate, diploma, and tutored courses in textile art, color studies, machine embroidery, paper and feltmaking, multimedia art, and dozens more. Whether you choose to visit our center in beautiful La Conner, or elect to enroll in our self-paced or mentored courses from your own home, we invite you to explore the resources we have to offer as you pursue your personal artistic goals. Color is important in many of the courses at our center. Level 1 Color is regularly offered at the studio and is also available online. 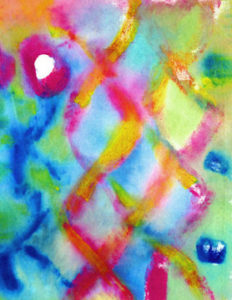 Color theory is explored and provides hands on experience creating and working with color and color schemes. 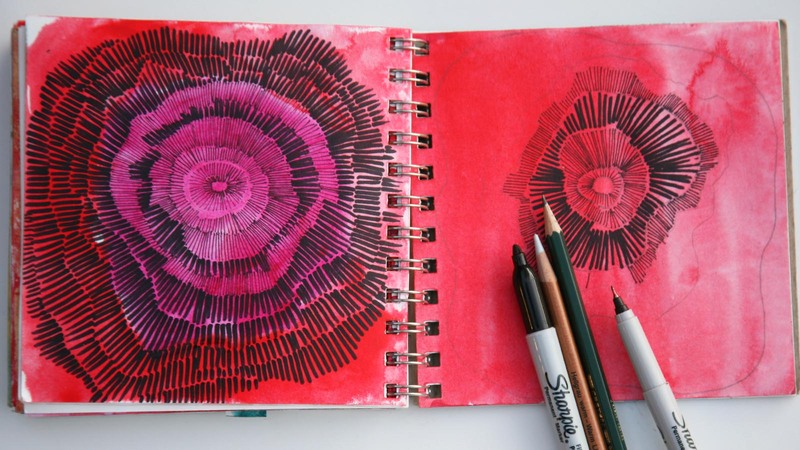 This course forms a foundation for Art, Design and Stitch Courses. There are no prerequisites to take any of the Level 1 Courses. Art and Design is included in a number of courses. 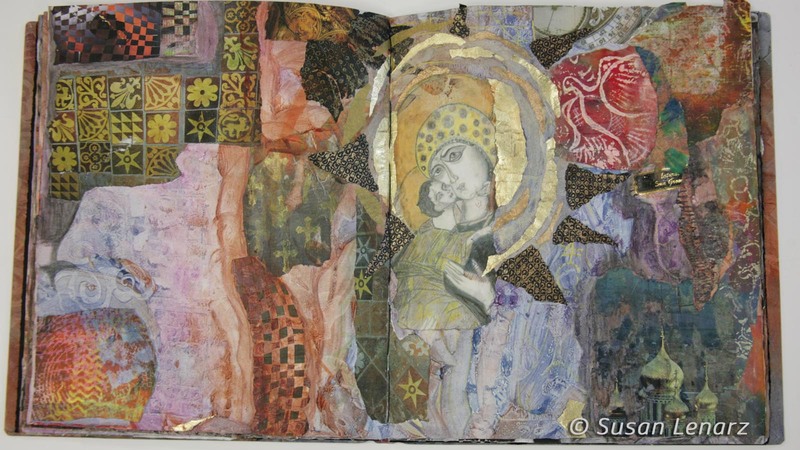 Some specially focus on the elements, whether working in paper, fabric or stitch. The Online Course Circles is such a course that I have developed over many years to challenge and stimulate new artists. Make your mark with needles and threads. 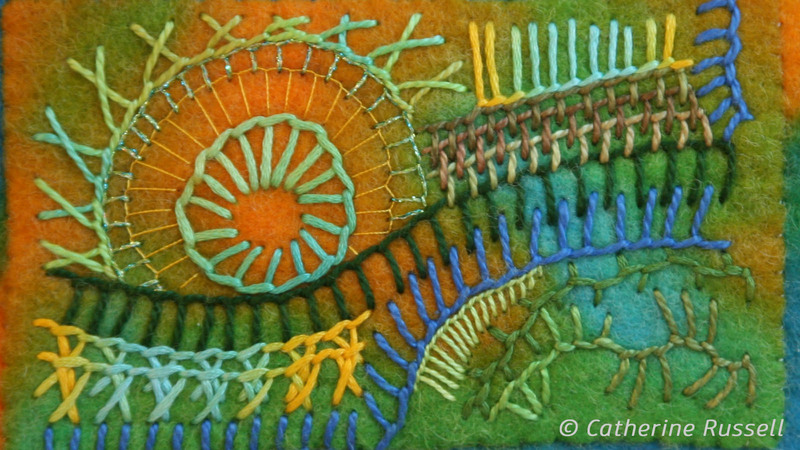 There are so many ways in which to make marks using threads on fabric or paper. Our students call it an addictive and compelling art form. Level 2 Studies in Art and Design is a foundation course over four sessions in which no prerequisite is required. It includes a section accommodating Level 1 Color, The Elements of Art and Design worked in playful exercises and everyday language. New skills are developed through working with different media such as acrylics, pencils, collage and more. Dyeing and painting of fabric and threads is undertaken on many of the courses. It precedes making stitch samples or projects. Some people have never stitched before, some have done a little and others want to expand their vocabulary. Do you have a fear of stitching on a blank sheet of white fabric? It’s similar to a writer being challenged with a white sheet of paper. It can be difficult to place the first image or word. Painting or dyeing the fabric can be a tremendous inspiration and often reduces the fear factor. Fabric Dyeing Leads to Inspiration! 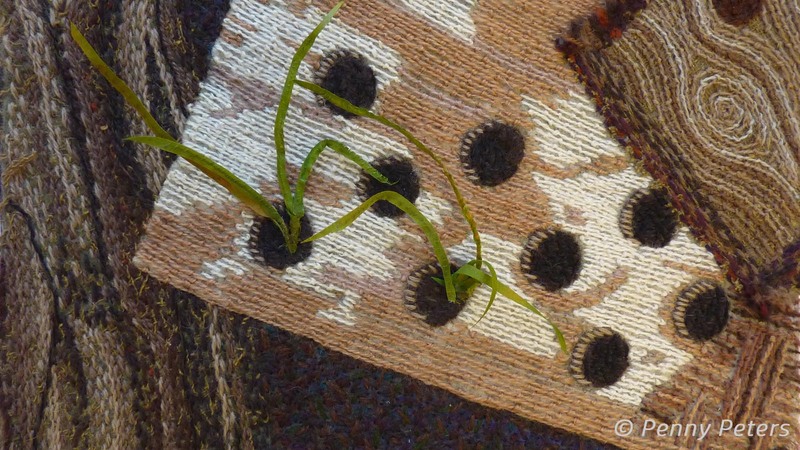 Students study historic and multi cultural approaches to the creation of stitched textiles. Some courses feature the study of design motifs and the techniques involved in making these stitches. A contemporary focus is given to new work. 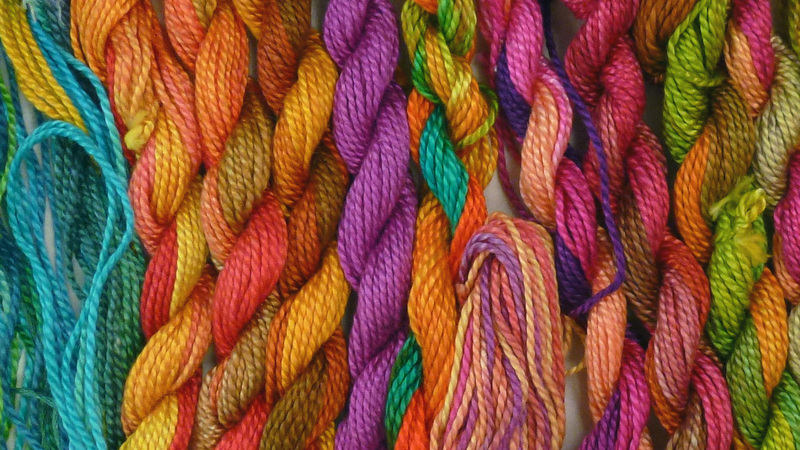 Dyeing threads is particularly rewarding, especially when you see the wide variety of colors and values that can be made from only a few dyes. Cotton stranded and twisted threads are used for dyeing and stitching. 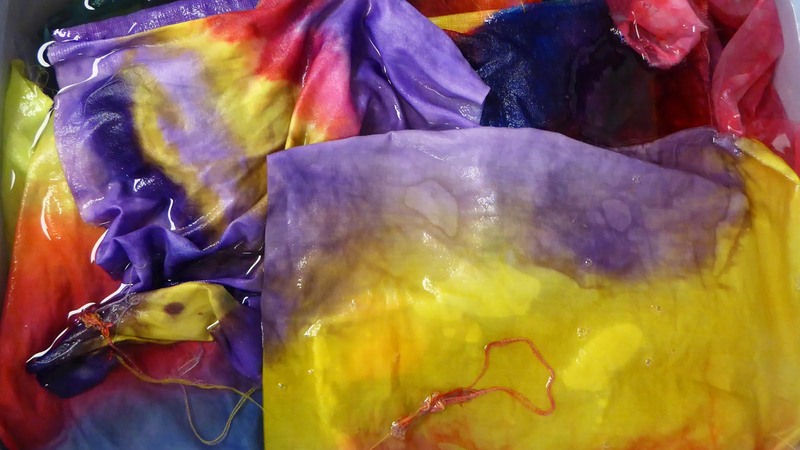 Dyeing Threads is included within the Level 1 Experimental Hand Stitch Course. 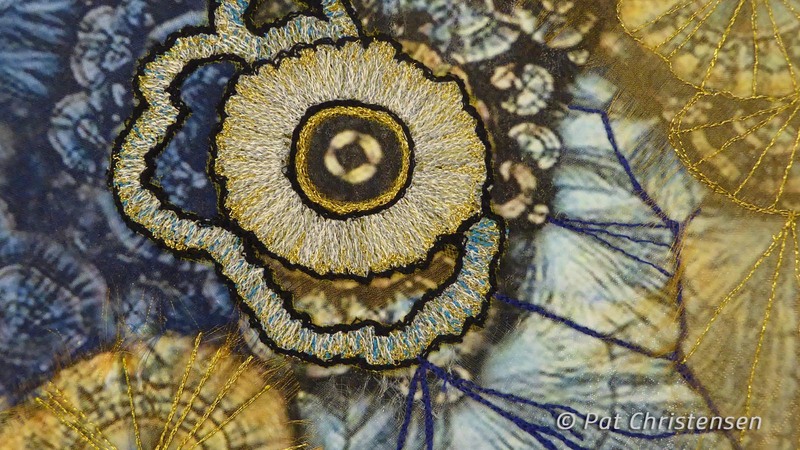 Our courses are well known for their creative contemporary approach to embroidery through basic design, technique and color. Level 1 Experimental Hand Stitch and Level 1 Experimental Machine Stitch combines and focuses on the variety of effects that can be achieved through imagination. Machine Embroidery was sometimes named Painting with the Needle – from the 50s onwards. Creating art with your sewing machine makes lush, rich surfaces. Level 1 Experimental Machine Stitch begins this journey of learning in a 5 day course. Hand Stitching or Embroidery calls up images of richness and historically has been the favored textile of Kings and Queens. Even and especially ordinary people like to express themselves with stitch. Levels 1, 2, 3 and 4 use Hand Stitch as an art form. Level 3 Studies in Art and Design supports our higher level Stitch Courses or may be used for those studying art and design as a stand alone subject. It includes and extends the basics of art and design. New skills are developed through working with a range of different media is used such as acrylics, pencils, different forms of collage, printing and more. Experimental Research for Advanced Design is the highest level of Design offered at our center. 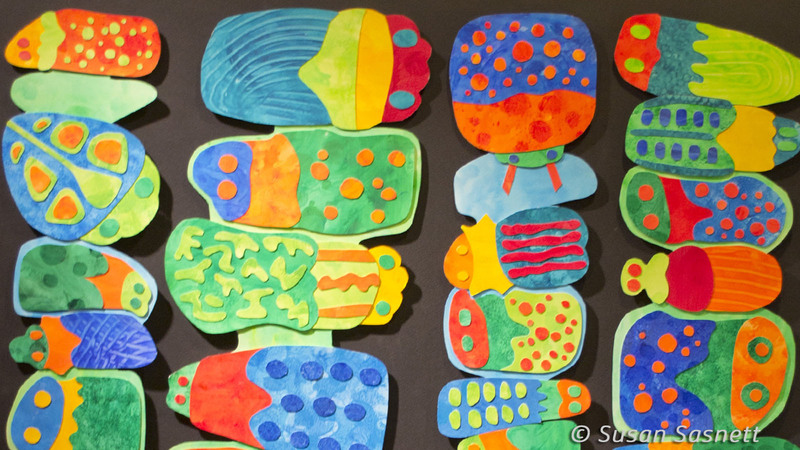 Students design large scale artwork, make handmade books and learn to illustrate an historical theme. They also are able to choose a topic to design from. During this course they advance their understanding of media from Level 3 Art and Design. Many of our students come from a distance and stay locally at Hotels or Bed and Breakfast venues. 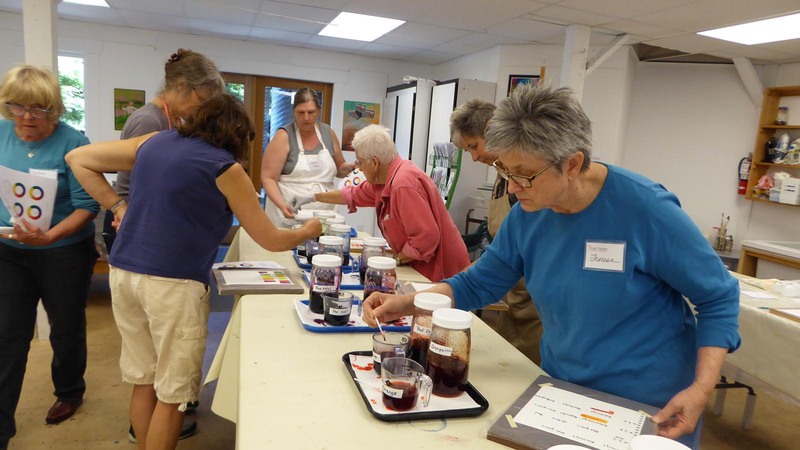 It is always a special time when they come together for a class, exhibition, an Open House or Artist in Residence Event. The last class in a series focuses on staging an exhibition or art event. The local public is invited to attend. There are a number of Special Interest Courses throughout the year. Anybody can attend. 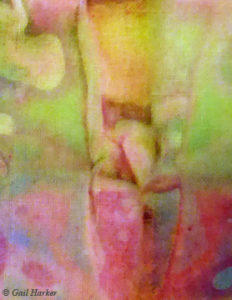 A wide range of art, design, fabric and stitch subjects are offered. This is a lovely way to learn a new skill with like minded people, or improve on what you already know. 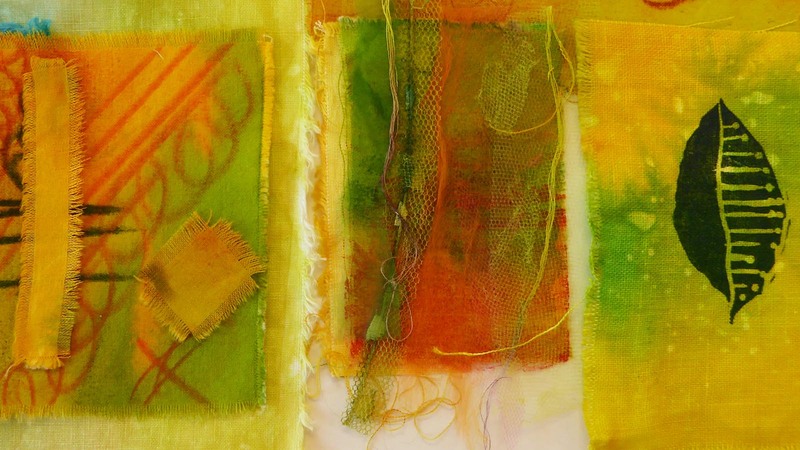 Materials play an important role for a textile artist. Different threads create different effects. We learn to stitch with a variety of thread and fabric types. 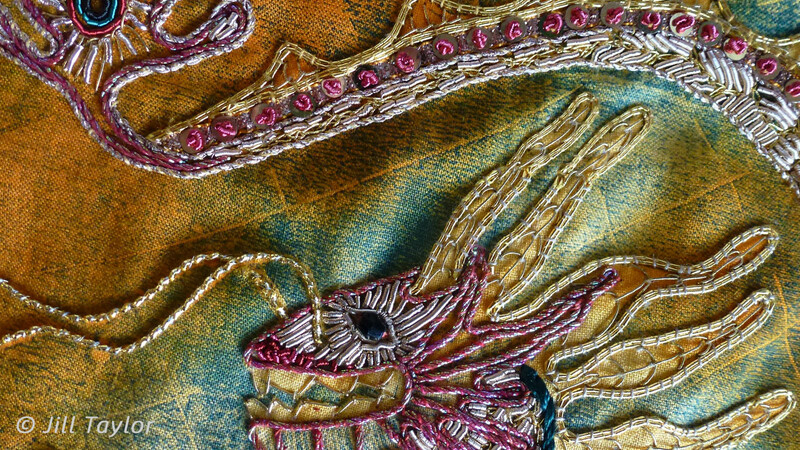 Stitching with Metal Threads (Goldwork) is a skill all its own and is offered for advanced students. There are a special selection of metal threads to learn about and to use. Interims (tutoring and mentoring sessions with students) are offered occasionally, either at the studio or online. These sessions are available to everyone. Students work at the studio and have individual tutorials throughout the day. An interim session may be set anywhere from 1 to 5 days. SAVE THE DATE! Grand Opening of our new home for our Center! All classes are now held at 503 Morris Street in downtown La Conner. Opening will include a special exhibition and artists in residence… more details to come soon! April 13-17 One of our most popular classes! 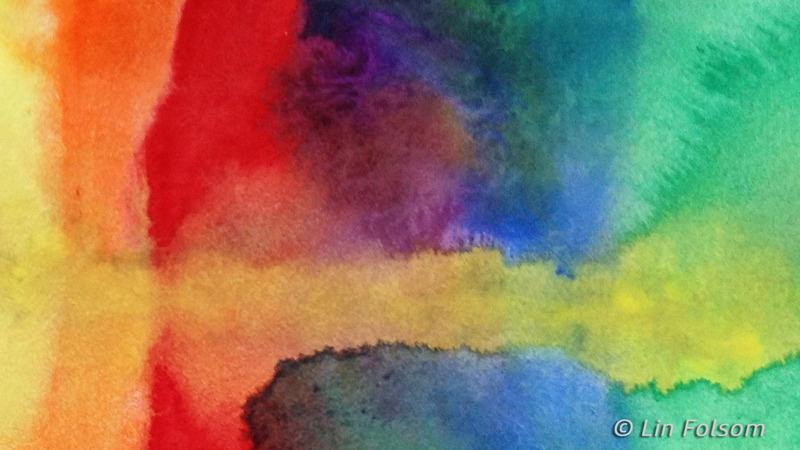 Color, color and more color is the focus of this 5-day hands-on class. Not a drawing class but essentials for design in any media! Click here for more info or to register. Learn techniques to color fabric for all your stitch, quilting, fashion, and fiber art projects! 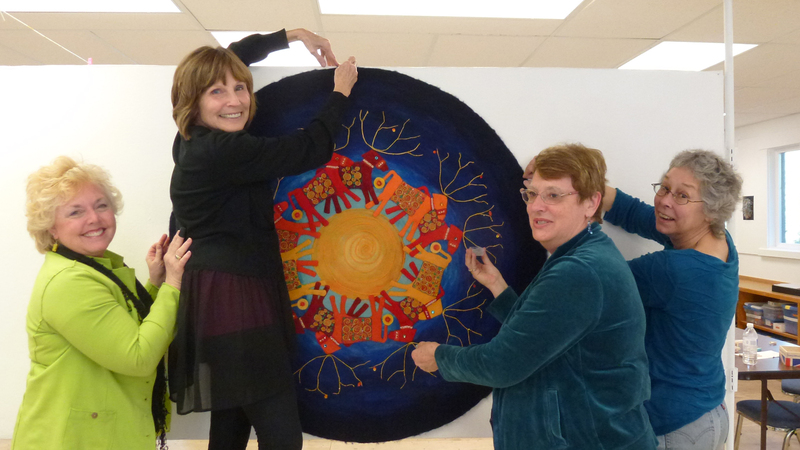 Click here to learn more about 25+ Ways to Make Art Fabric or to register for the class! 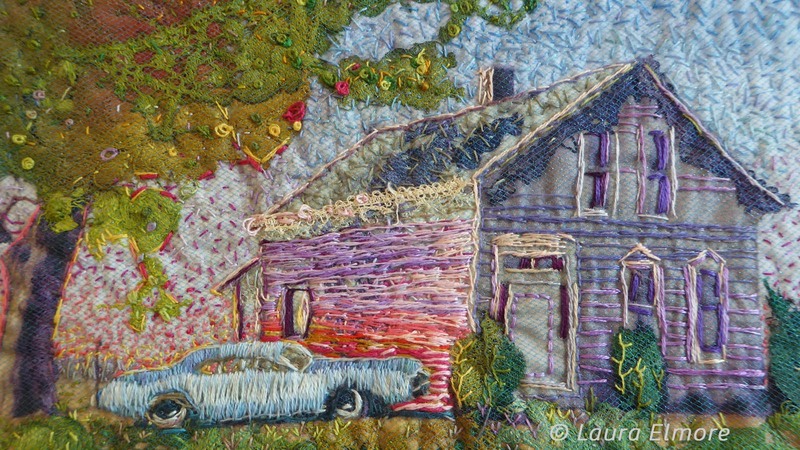 OPEN HOUSE featuring the work of our Level 2 Experimental Machine Embroidery Students on Saturday June 22, 2019. EXHIBITION of Level 4 Advanced Research for Design Students at the Center Saturday July 27- Sunday July 28, 2019 from 11 am-4pm. New Special Interest Courses open! 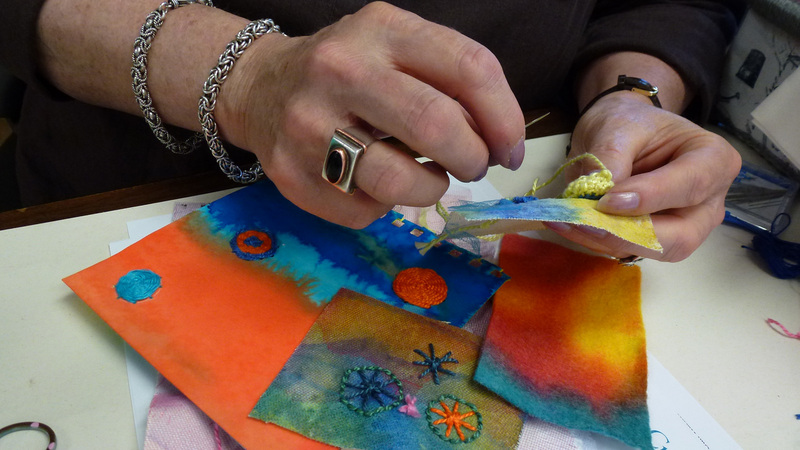 25+ Ways to Create Art Fabric; Mentoring Sessions in Studio; and Collage and Color. Color Studies: Level 1 – A short slide presentation in color adds extra information to the Color brochure. Our 2014 “Glories of British Textiles” brought students to explore numerous museums and meet local stitch experts for in-person study.